You call that a center channel? Installation in Jetlag Bar, London, installed by Moda ES Ltd, with Artcoustic Spitfire Venue loudspeakers (those three lovely pieces of art on the walls) and subwoofers, and Seymour AV Center Stage XD drop down 2.35:1 screen. A write-up in Essential Install, (pg61) can be found here. 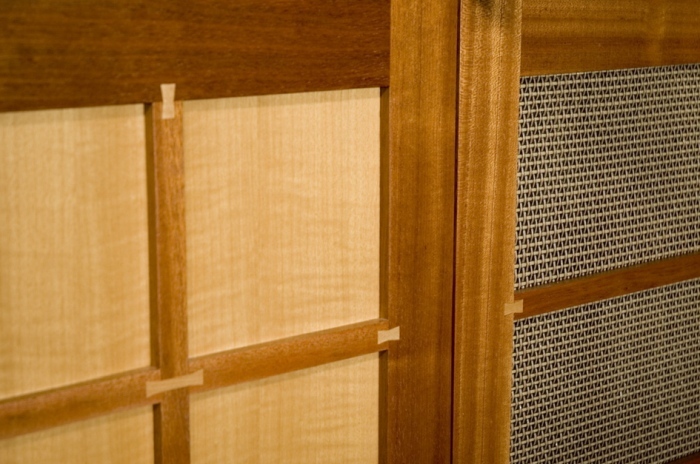 Custom cabinet by Honea Woodworks. Brad's original H095 screen in the above picture. In the picture below, you can see his upgraded F115 Center Stage XD screen. "The new XD screen is great. Thanks." 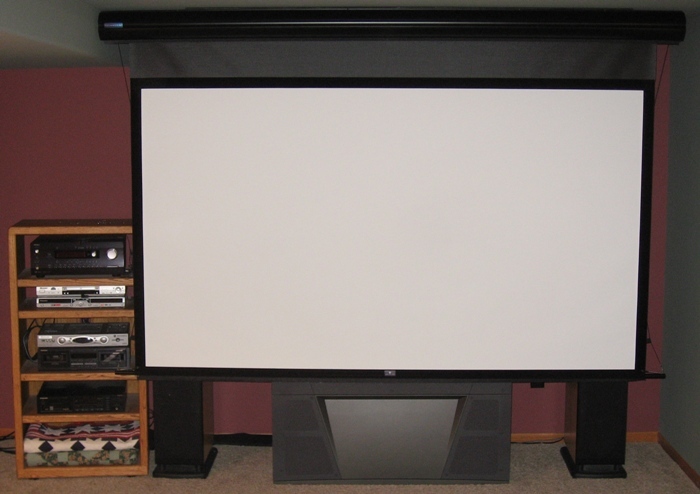 Brad used two Peerless model SA745P articulated mounts to install the screen. 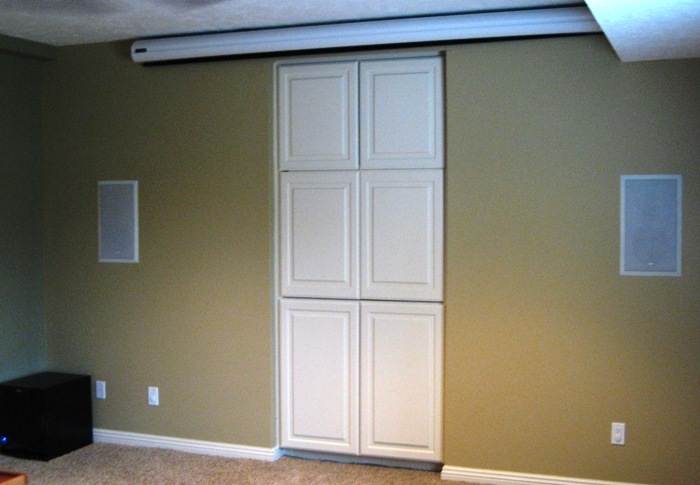 He cut the mounting bar in half and bolted a piece on each arm. 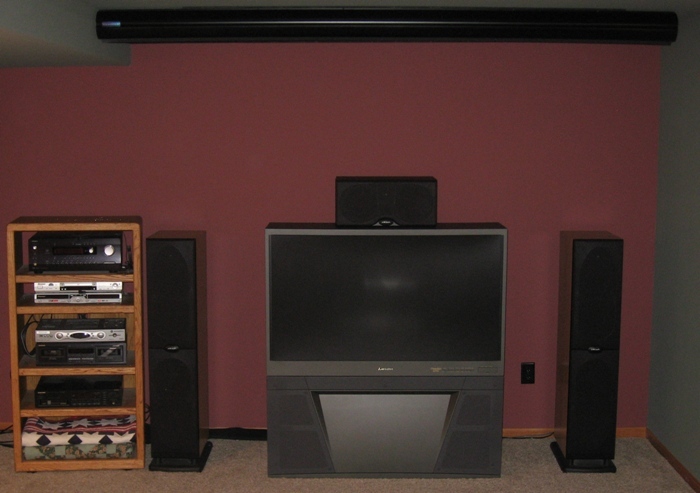 "The screen is a SeymourAV acoustically transparent screen (due to my center speaker being housed in my A/V center I needed an AT screen) and is of excellent quality. 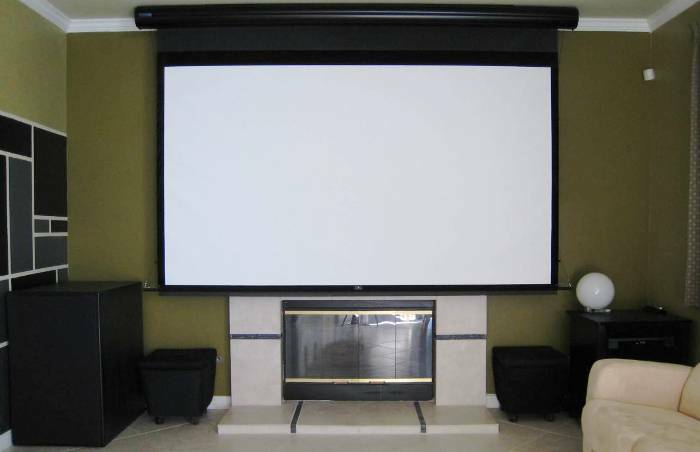 It's a 104" diagonal screen which is roughly 4x the size of the 53" RPTV I use for normal viewing. It gives me a great viewing experience while not being so large as to be too dim (a common mistake many folks make.) Actually, its almost too bright now! But as my lamp dims it will become much more viewable. 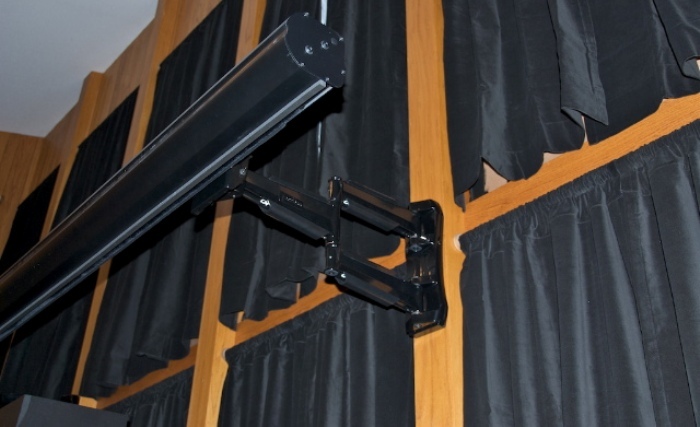 It has a black backing layer to keep reflections and equipment LED light down. 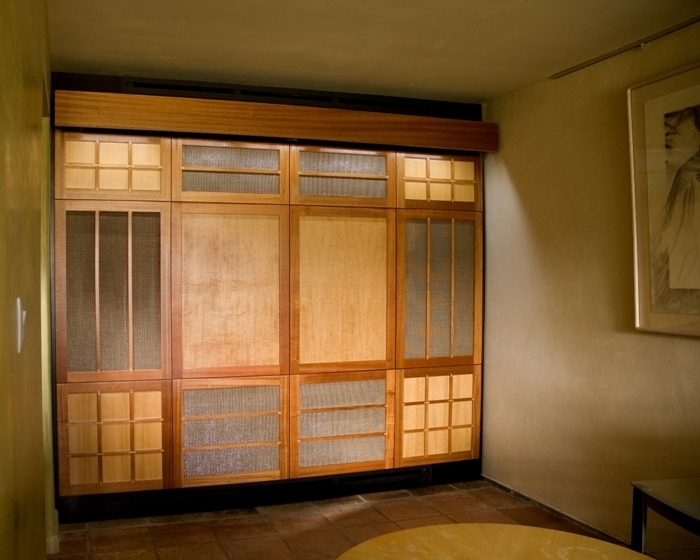 It's pretty effective but I still need to cover a few of the really offensive LEDs that can still be seen during dark scenes." 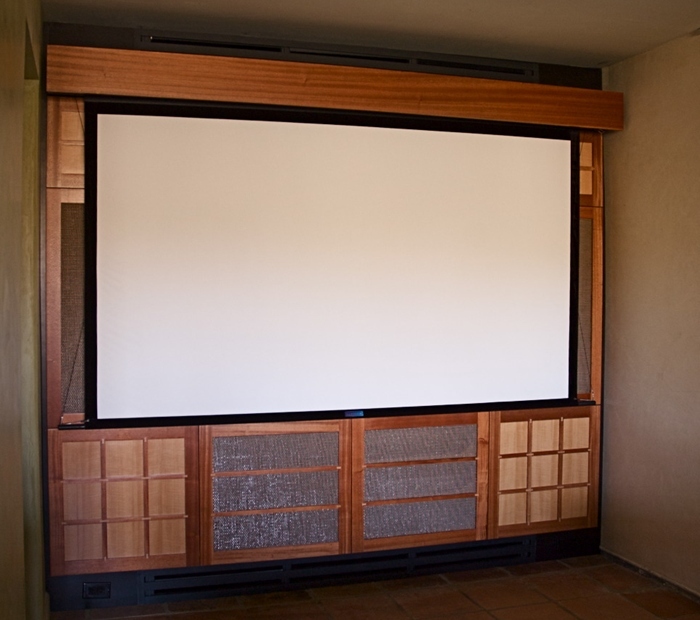 Custom H120 screen in a brushed aluminum case, which allows Frank to watch Oprah on his LG flat panel or drop down his Center Stage acoustically transparent projection screen for big screen viewing. 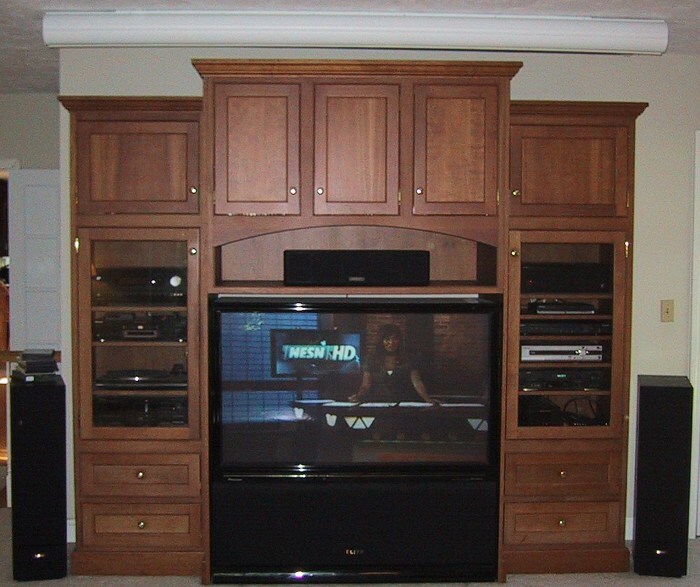 "My father always wanted a home theater in his house but he has never had a dedicated space. 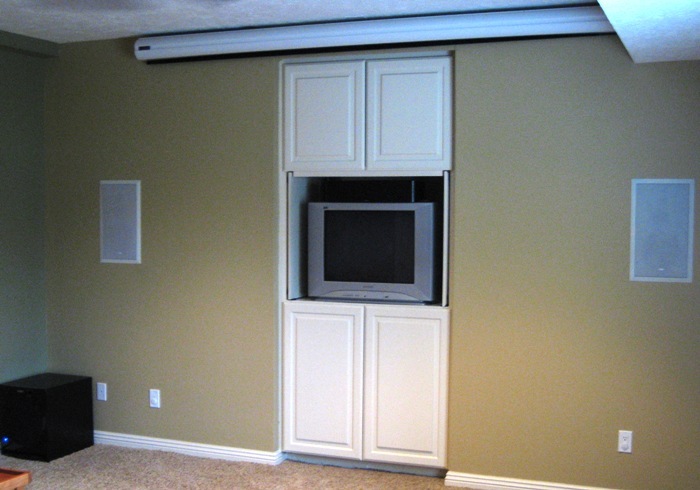 The only option we had was to use the existing family room. 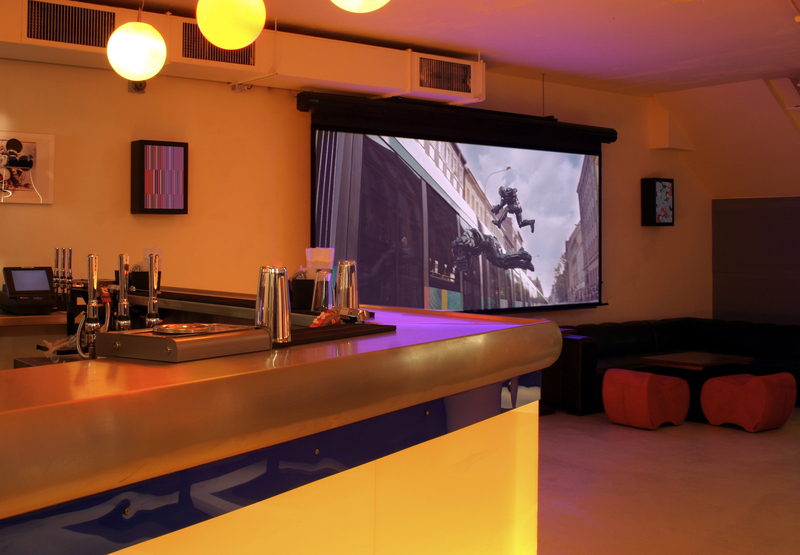 We wanted to keep the room dual-purpose and yet still enjoy the benefits of a truly cinematic experience. 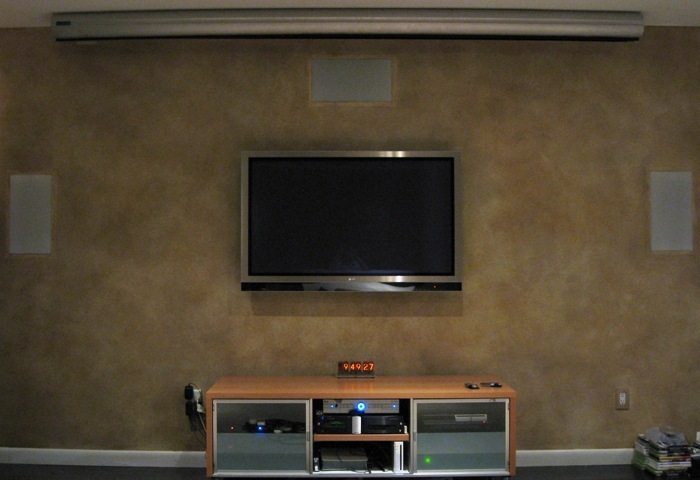 We accomplished this with an H100 electric drop-down screen from Chris Seymour at SeymourAV. 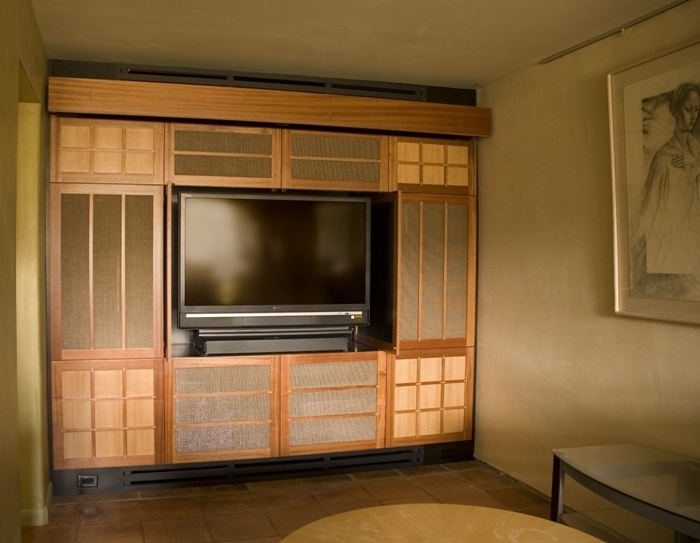 The acoustically transparent material allows the speakers to disappear when lowered and provides the theater experience by combining the audio and video into one seamless presentation. Special thanks to Chris who answered all of our questions from beginning to end. 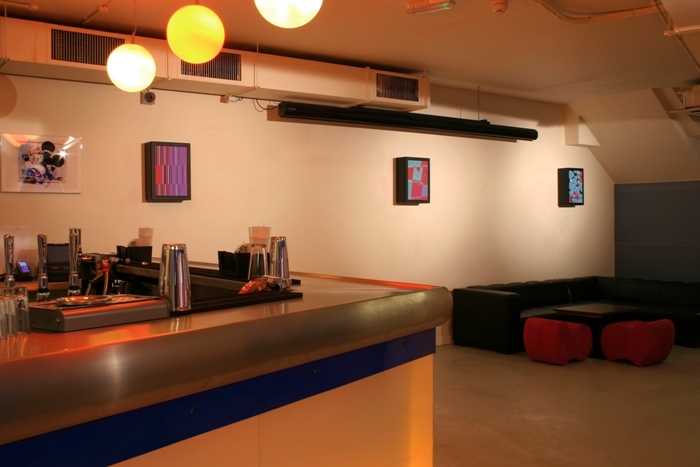 The product and service are truly fantastic." 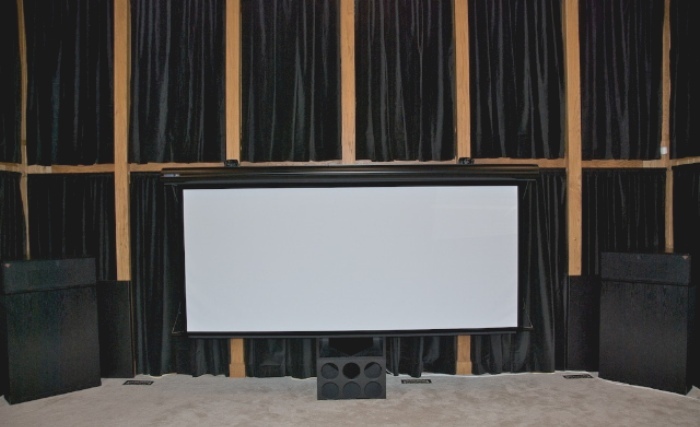 "I got my Seymour AV electrical acoustically transparent projection screen installed last week. 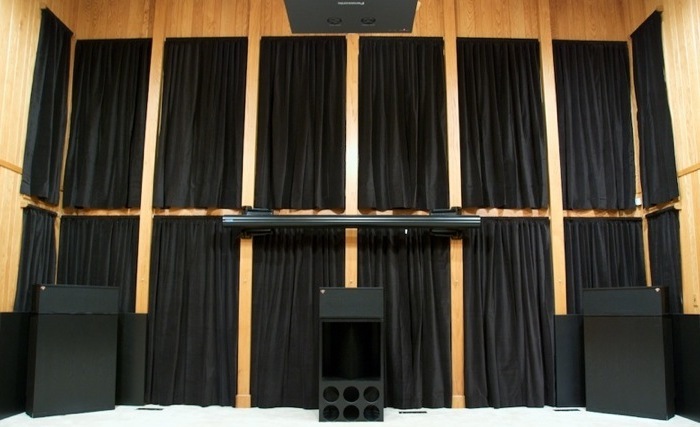 We had a party over the weekend with about 35 adults and 15 kids....and they all where blown away by my Home Theater. 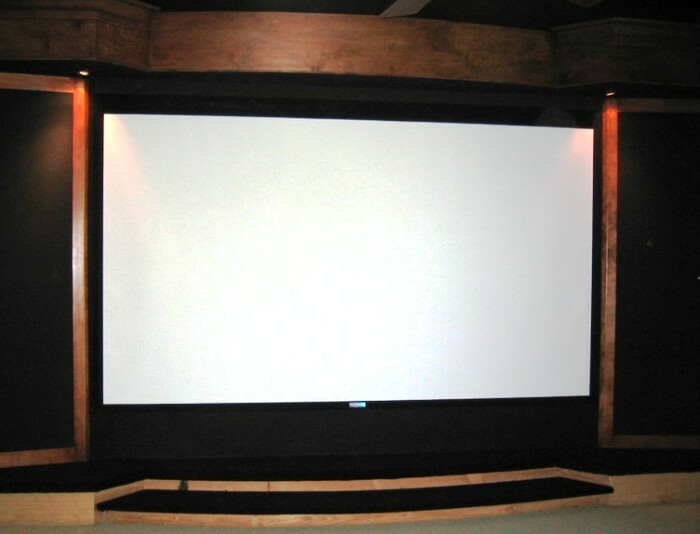 The screen quality is amazing...people could not believe that the picture quality could look so good on an acoustically transparent projection screen. 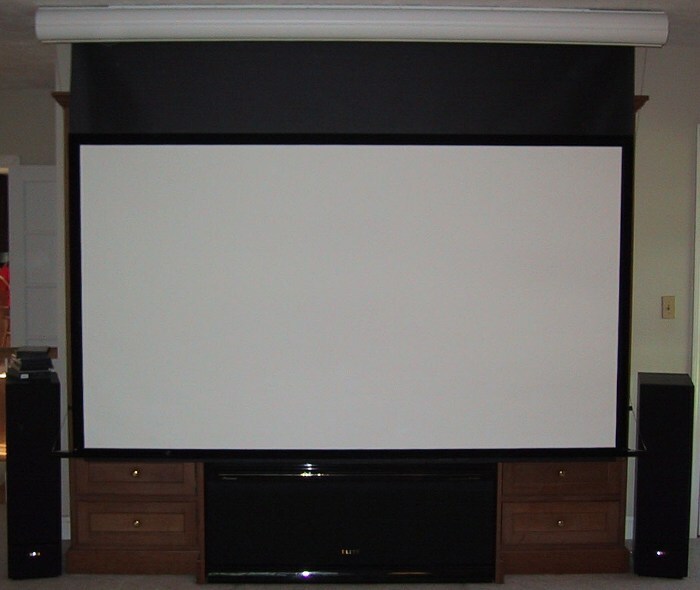 When I drop down the 115" Seymour AV electrical retractable, acoustically transparent projection screen in front of my 60" Pioneer TV....Everyone's jaw dropped...'WHAT THE' I'm very happy with everything about Seymour AV. Customer service was awesome to deal with. The quality of the screen is awesome. I was impressed all the way down to the packing and the shipment of the screen. 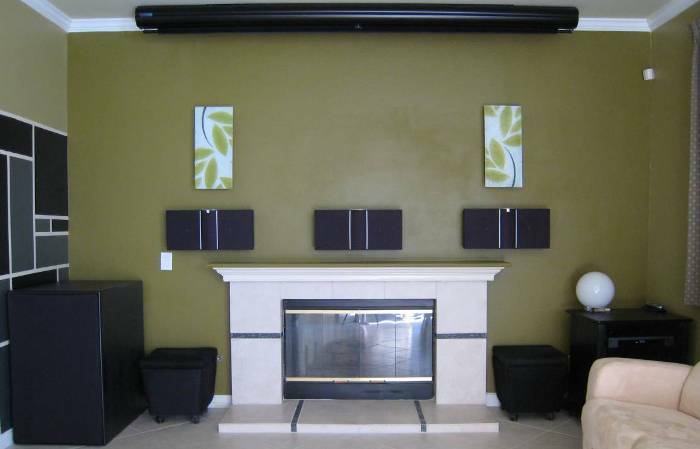 I would highly recommend Seymour AV screen to anyone who is looking for an Acoustically Transparent Screen." "I just thought I would drop you a quick note and say that I installed the screen last night, and it works and looks great! Of course I expected it to work very well and look better than my previous DIY screen, but I was really surprised at how much my picture quality improved. We watched “Juno” on Blu-Ray, and the picture was perfectly smooth and moiré free, which of course is from the angle cut, and while somewhat expected was better than I had imagined. The most surprising part to me was the improvement in contrast ratio, which has to be due to the black backing material. Even though I have a lot of black equipment behind my screen, the light reflecting off the tan back walls was no doubt interfering with the PQ more than I imagined. 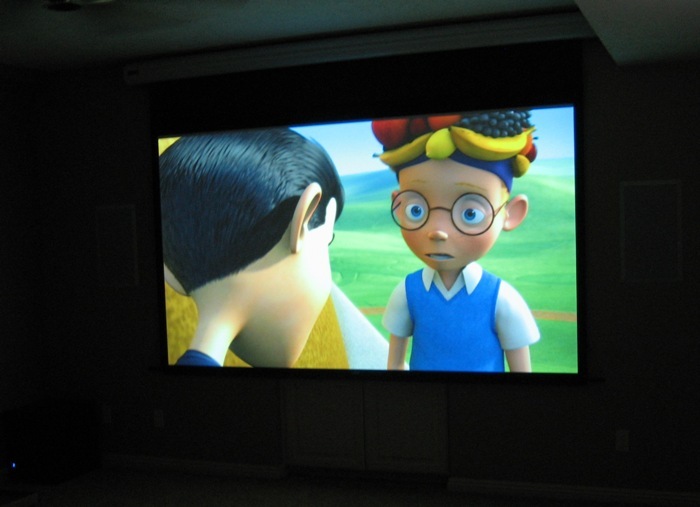 So when you combine both of those visual improvements with a great looking, wave free screen, I finally feel like my projector video quality is finally reaching its full potential. 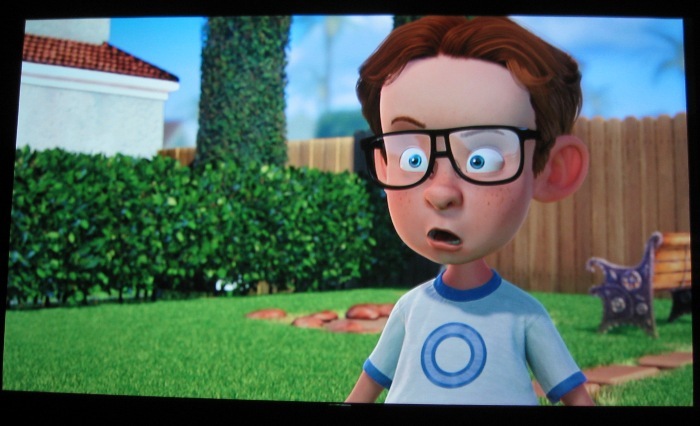 Much of the movie on your new screen had a 3D look to it, which is when I know the video 'gods' are smiling on me."